St Monica's Catholic Primary is a one-form entry school situated in the heart of Hoxton. We cater for children aged 2 to 11 years; from Toddlers (2 years) to Year 6; with a central aim of building them up into effective citizens of the world, with deep Catholic ethos and the love of Jesus Christ. While 90% of our children are Catholics, we welcome children from all faiths and our children come from all walks of life. We aim to create an atmosphere of mutual respect which foster development and growth to enable all the children reach their potentials. 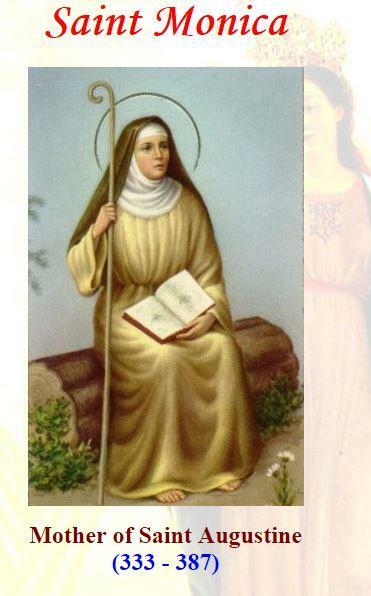 Saint Monica was born in 333AD in Tagaste, North Africa, which is now part of modern-day Algeria. She came from a Christian family. Her parents married her to a much older man named Patricius with whom she had two sons, Augustine and Navigius, and a daughter named Perpetua. Her husband was unkind and Monica suffered greatly; being a pagan, he was very critical of her Christian faith and practices. For thirty years, Monica prayed unfailingly for the conversion of her husband; and a year before his death, Patricius converted to Christianity. By this time, her son Augustine had left the family home and although he had been brought up in a Christian home, he was living very un-Christian life. Monica prayed fervently for him and even sent him to a bishop for counselling. She was very devout and through the influence of Saint Ambrose whom she met, Augustine converted to Christianity and was baptized at the age of 28. She spent the rest of her days with him in Ostia near Rome, where she died at the age of 56 in AD387. She is revered by mothers because of her tireless prayers for her wayward son, Augustine. Her relics are enshrined at Saint Augustine’s Church in Rome.